Comfortable, convenient, safe and friendly!submitted by Amy B. - Oct 01, 2012 |Recommended: YesIt's in a great location, close to everything but still quiet. The staff and doormen/women are excellent and I never have to wait for maintenance needed. It's great to have a huge laundry room, gym, pool, and in facility dry cleaning. My apartment is fantastic as is the view! It's a great to place to live in the city without having all the tourist around.submitted by Carli R. - Sep 18, 2012 |Recommended: YesIt's a nice place to live. The best view in Chicago.submitted by David W. - Sep 05, 2012 |Recommended: YesIt's pretty expensive, but for the area, view, and amenities- it's made living here that much easier. It's home, and I go to bed and wake up in the morning comfortable, and that's all that matters at the end of the day. response from property - May 15, 2013 Enjoy your new home and please let us know if we can help in any way! Best property I have ever lived in. Home, sweet home.submitted by Trusha B. - Aug 02, 2012 |Recommended: YesI would tell them that the welcoming and amazing staff does a great job of giving you a positive first impression. Everything else lives up to all expectations. Great view, missing the sauna/jacuzzi, slow elevators.submitted by Will F. - Aug 01, 2012 |Recommended: YesFriendly place, great location/view, but still don't understand the dismantling of the fitness center's best features. response from property - May 15, 2013 We do agree that our views at Cityfront are amazing! We would love to show you all the features we will be adding during our renovation such as a new amenity room, business center, conference room and new yoga room. 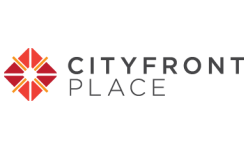 We think these new amenities are going to make Cityfront an even better place to live! Love itsubmitted by Marlon M. - Jul 01, 2012 |Recommended: YesGreat experience, friendly door people, beautiful location. response from property - May 15, 2013 Thank you, we love it too! The staff is amazing and the location very special.submitted by Donna O. - Jul 01, 2012 |Recommended: YesCityfront Place is a hidden jewel in Chicago. response from property - May 15, 2013 We think you're a rare jewel as well, whoever you are. Enjoy the rest of your summer! Great building, great peoplesubmitted by Leah L. - Apr 03, 2012 |Recommended: YesI have lived here over 5 years and only have 1 complaint. I've been trying to get a screen for my window for 3 of those years. Other than that, most everything is great! response from property - Aug 13, 2012 Thank you for your feedback and we hope you're enjoying your new screen. if there is anything else we can do to help, just let us know! Decent apartments in a great location.submitted by Jose P. - Feb 08, 2012 |Recommended: YesIt's in one of the best spots in the city; secluded but close to everything. The apartments and facilities are fine. Maybe a little more dated than you may think. response from property - Feb 09, 2012 Thank you for your comments. We are actually pleased to have an open house tonight to view upgrades in the apartments and would love to show you. With your comments related to the location and we agree, you also mention the apartment needing updated, and we too agree. There are some great new finishes being demonstrated tonight between 6pm and 8pm. Come see us at the doorman station when you come home and we will give you a tour! It is wonderful.submitted by Jeffrey M. - Jan 28, 2012 |Recommended: YesIt is very nice and a great value for what you pay. response from property - Feb 02, 2012 We have some new plans for Cityfront, join us on the 9th of February for our resident event! Posting at the lobby elevator will begin Friday for this great event. response from property - Feb 02, 2012 Thank you for the feed back. We certainly try to provide the best service and building possible! response from property - Feb 02, 2012 We plan to include the fitness center in rent once lease renewals come up and as we complete the renovations on the 8th floor this year. Come see us to learn more about the renovation plans. Good building in general, fitness center needs attentionsubmitted by Achint S. - Dec 06, 2011 |Recommended: YesI would totally recommend the building. I personally have a request though. The fitness centre should be made 24 hours. Th hours are too restricted esp. for a person like me who travels a lot - so would like to use the gym more often but can't coz it's closed most of the times I'm around. response from property - Aug 13, 2012 Thank you for your feedback. Our fitness center is now open 24 hours for residents to enjoy. Please let us know if there is anything else we can do to make your home more enjoyable. response from property - Aug 13, 2012 Thank you! Great location and staff.submitted by Janet H. - Oct 30, 2011 |Recommended: YesThus far, everyone has been extremely nice. I like the building and all of the amenities; very tenant focused and worth the money. response from property - Feb 02, 2012 Thank you for the kind words! 2012 is an exciting year and we would love to share the plans for Cityfront with you, join us on the 9th of February for our next resident event!